The condition of the sleeve is Near Mint and both sides of the vinyl are Near Mint. Also includes the original sleeve sticker. SLEEVE (stickers top right see photo's) & VINYL - VERY GOOD CONDITION. 7" JUKEBOX VINYL. EX:Has been played but has no visible marks. The only exception to this is 'AA' sides. Vinyl - NM. A Design For Life. Label: EPIC. Cat No: 01 663070 00. 'Slash 'N' Burn'. A1 B1 matrix numbers! Slash 'N' Burn. Both labels are clean and have no spindle marks. Looks barely played.The record grades near mint condition. The limited edition numbered art print has no creases. Motown Junk 7 : Manic Street Preachers. Nicky Wire - Break My Heart Slowly 7" Vinyl Manic Street Preachers in ex condition. Please take a look at the other vinyls we are selling. We will no longer ship to Brazil PAYMENT WITHIN 2 DAYS PLEASE. FOUND THAT SOUL. Found That Soul. NUMBER 2475 7" VINYL SINGLE. UK ORIGINAL 7" SINGLE 1994 ISSUE. ALL ARE GRADED BY INNERS FIRST AND THEN DISC. ALL CD’S, TAPES AND VINYL ARE UK ORIGINALS UNLESS OTHERWISE STATED. UK - £1.40. UK – £3.00. UK - 1.00. EX – EXCELLENT. This single is in excellent condition and appears very little played. B side is Everything I Do (I Do It For You) by The Fatima Mansions. Original UK 7" in Picture sleeve. Disc & sleeve are in excellent Condition, showing only the most minor signs of use. Th ANNIVERSARY. Dead Trees and Traffic Islands. A DESIGN FOR LIFE. A Design for Life. A Design for Life ~ Stealth Sonic Orchestra Remix. From 2016 – NEW and SEALED. Condition –MINT / UNPLAYED (SEALED). Vinyl 12" Single. A Design for Life. A Design for Life ~ Stealth Sonic Orchestra Remix. "Your Love Alone Is Not Enough". 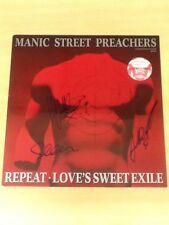 Manic Street Preachers - It’s Not War Just The End Of Love 7” Vinyl Signed Please see photo 2 for the track listing hand signed In Ex condition Please take a look at the other vinyls we are selling. INTERNATIONAL SIGNED FOR ONLY,BUT WE CAB SEND 3 7” VINYLS FOR THE SAME PRICE AS 1 PAYMENT WITHIN 2 DAYS PLEASE.
" LOVE'S SWEET EXILE ". ORIGINAL 1991 SONY 7" PICTURE SLEEVE ISSUE. Artist: GAYE BYKERS ON ACID. Title: ALL HUNG UP. Year: 1987. Condition (Sleeve/Disc): VG /EX. Manic Street Preachers - Slash N Burn 7” Vinyl Signed Please see photo 2 for the track listing hand signed In Vg condition Please take a look at the other vinyls we are selling. INTERNATIONAL SIGNED FOR ONLY,BUT WE CAN SEND 3 7” VINYLS FOR THE SAME PRICE AS 1 PAYMENT WITHIN 2 DAYS PLEASE. 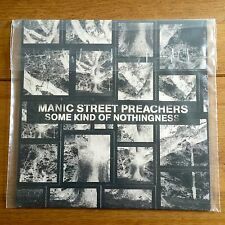 MANIC STREET PREACHERS " SHOW ME THE WONDER " EX+ COND.IN PIC SL. RECORD CONDITION IS " EX " . Format: VINYL. Title: A Design for Life. Condition: New. Hand signed by the great man him self. A. Love's Sweet Exile. 1991 UK 7" Vinyl Single Record. See my other 7" Vinyl Records & my CDs. Columbia – 657582 7.